Using the very latest coated glass, Oaksoft™ contains Low E glass which usually forms the inner pane of an IGU (Insulating Glass Unit). The glass has a transparent metallic coating that reflects heat from radiators back into the room, rather than allowing it to escape through windows. At the same time it allows free heat and light from the sun to pass through the glass, warming your home and further contributing to the energy efficiency of your windows. Low Iron glass has very low iron oxide content, as a result the glass has a very high light transmittance level and a much clearer appearance (compared to ordinary float glass). This enables better clarity, visual quality and truer colours to be seen. Low Iron Glass also provides increased solar heat gain. Increasing solar gains improves thermal losses. Oakland Glass Ltd introduced Super Spacer® to the UK back in 2004, installing one of the first fully automated Warm Edge production lines. Up to 2dB in noise reduction, the structural foam make up absorbs more noise, minimising noise transfer into your home. 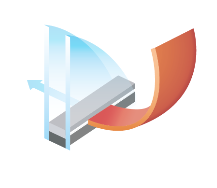 Oaksoft™ Energy Saver is incorporated into our Triple Glazed units. Triple Glazing consists of 3 panes of glass, each separated by a cavity, the insulating panes slow down heat loss improving thermal properties and further improved sound insulation.